This story begins long before Danila’s birth. His parents were looking forward to their first child. “There was no cause for concern during pregnancy, and of course we didn’t expect our son to have health problems. Frankly speaking, hardly anyone expects it”. At that time, Olga was only 20 years old, and her husband, Andrei, was 23. “Daniel was born with a cleft palate, but the most shocking thing was that he did not have external auditory canals and ears. These seven days in the hospital were the worst nightmare of my life”. Andrew did everything he could to support his young family and often slept in the car near the hospital. “Our son was examined in the Mother and Child National Research Center in Minsk. After all examinations, it has been found out that Danila has fused ribs and deformed thorax”. Since birth, Danila has been fed through a feeding tube, because of the underdevelopment of jaw and a cleft palate. Only a month and a half later he was discharged home. For five months Olga and Andrei took turns feeding the son through the feeding tube, but at home it was somehow better: after all there is no place like home. “In the republican scientific and practical center for otorhinolaryngology in Minsk we were diagnosed with a second degree of hearing loss. 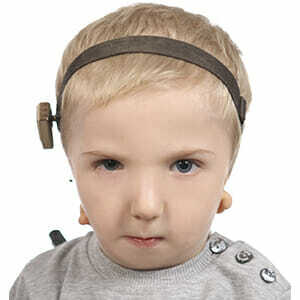 We bought a pocket hearing aid, that enabled Danila to hear like an ordinary child”. The first aim of parents was to cope with cleft palate. It goes without saying that it was not easy. It took doctors three attempts to perform the operation: in October 2016, Danila underwent plastic reconstructive surgery of soft palate. The next operation was planned for September 2017, but it had to be postponed to March, because the boy got sick too often. Endless searches led Daniel’s parents to doctors from California. “We visited the conference of doctors Rainish and Robertson, that was held in Moscow in the spring of 2016. Danila was diagnosed with “Goldenhar syndrome” by the doctors. In our case, unfortunately, it’s impossible to open the ear canal. But we were recommended to undergo ear reconstruction surgery and implant hearing aids, using the MEDPOR® technique”. In 1991, Dr. Reinisch introduced a newer technique, known as MEDPOR® ear reconstruction. The technique requires material called Medpor that is completely customized before surgery to be the right size and shape for the patient. The older method of ear reconstruction uses rib cartilage to create an ear framework. It not only takes multiple stages, but requires a large amount of cartilage, which delays reconstruction until there is sufficient cartilage available. MEDPOR® ear reconstruction can be performed in one-two stages, that significantly reduces the risk of infection and the pain, that the child has to experience. “Most of all in the world we want our child to be healthy and live a full live. He is our small hero who had to come through dozens of examinations and analyses. And finally we have met the doctors who are able to change the life of our son – Dr. Reinisch and Dr. Roberson. The only problem is that the costs for the operation are too high. Needless to say, that I couldn’t believe my luck, when UNIHELP agreed to help us. It’s simply an immense amount of money for us and our country. Daniel has only one dream: to go to school with healthy ears. And you are our last hope to make this dream come true”.